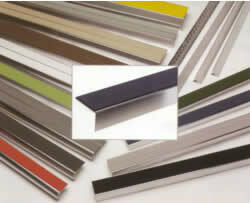 for all types of aluminium profiles. Chrome Anodised Mirror Flect Finish similar to polished stainless steel. or alternatively you can use stickdown stair nosings - both profile types are priced the same. Profiles can be square, bull nosed, raked back or chevron fronted - they can also have double inserts. Our stair nosing products are specially designed for most commercial, industrial and domestic projects. sales@stair-nosing.co.uk or alternatively give us a call on (01274) 394904.